Just a little over a week ago, a wildfire of devastating proportions engulfed the Town of Paradise in a matter of minutes. Families, seniors, adults, children, and the entire community had to evacuate quickly. Lives were lost, homes were lost, and the tragedy of it all is still sinking in for many. Thousands of people are lending a hand, donating food and household goods - it's absolutely amazing how the community is coming together to provide aid to those in need. Even the pets and livestock are getting assistance... did you see the recent story about the Oroville CHP Officer who happened upon a flock of backyard chickens in Paradise? He was patrolling for looters and heard something that sounded like...chickens! They were unharmed by the fire but had no food or water. He went right into action and got them both to them, and they even left some eggs for him the next day. With so much ash, debris, and smoke - this leaves us to wonder how safe our chickens are in the environment, along with the food they produce. Earlier this year, UC Davis research team Dr. Birgit Puschner and Dr. Maurice Pitesky began a study on this exact topic, collecting and testing eggs from chickens where fires had taken place. Although the findings are not yet available, their research will become especially important after the recent #Campfire. Sacramento CBS Local aired a story about the research back in April. According to an article published by UCCE (after the Tubs fire in Sonoma), "In addition to all the destruction and inhalation of smoke associated with the recent fires in Northern California, one of the unfortunate legacies remaining are chemical contamination of land, soil and water. The wildfire debris can include household hazardous waste (e.g. batteries and other electronic waste, paints, flammable liquids), building material (e.g. stucco, sheetrock, joint compound, asbestos siding and pipe insulation), pesticides, and fire suppression chemicals that may have been used. For example, ash debris from the California wildfires from 2007 was found to contain heavy metals that could cause long term health effects with exposure at high levels" (1). 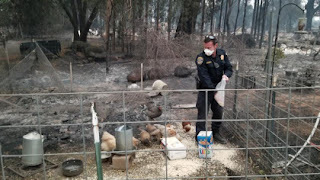 Because chickens forage by scratching, pecking, and exploring their environments, it may be wise to limit their exposure to any areas decimated by wildfire. Backyard chicken keepers may also want to exercise "an abundance of caution" when considering whether or not to consume the eggs of chickens that might have ingested any form of contaminants. At this time, scientists are uncertain of the risks associated with fire-related contaminants and withdrawal periods. So how about the smoke? Consider using temporary coopscage/ to house your chickens indoors. Locations such as a garage or empty laundry room may suffice. Look for signs of labored breathing, or inactive, lethargic behavior. If you are very concerned, always seek the advice of a Avian Veterinarian. All victims of the fire are in our thoughts and prayers! No matter where you live - have an evacuation plan and be prepared in case an emergency happens. Donation centers are still in desperate need of livestock feed and supplies! Contact the University of California Livestock and Natural Resources Advisor or the Butte County Ag Department. (1) Puschner, B., Pitesky, M. (2017, October 27). UCCE Recommendation for Backyard Poultry Owners in Areas Affected by the Fires. Retrieved from URL. Virulent Newcastle Disease has entered our southern California region yet again! As backyard poultry owners, we have an obligation and responsibility to learn how to recognize the signs and symptoms of this disease and be diligent about protecting our flocks. I was recently interviewed as a PHI (CDFA Certified Poultry Health Inspector) on the KSTE Farm Hour with Farmer Fred, and explained some of the things backyard chicken keepers need to know. Please take a moment to listen! The link is below. DON'T WAIT....get the water bottles in the freezer so you'll be able to alternate (have one extra that is freezing while the other one is being used). Use the frozen bottles of water to give the chickens something cool to stay near when needed. Make sure your chickens have shade, and have a box fan ready to turn on to keep the air flowing (a timer works great). DON'T FEED....hold back on the feed until either the late evening or early morning hours when its cooler. Avoid all scratch or corn when it's in the 90's or higher. Carbs create more body heat when digested, so help your feathered friends during the heat wave by staying away from the snacks. COOL DRINKING WATER...is a necessity. Change the water in your waterers frequently and use cool, fresh water with electrolytes or baking soda (1/4th cup per gallon) to help increase the blood pH "buffer" of your flock when they are at risk for heat stress. WATCH....for signs of heat stress in your flock. They will naturally start moving less, drinking more, holding their wings from their body, and panting. A normal chicken's body temp runs around 106 degrees, and they do not have sweat glands - so when the air temps increase they have a tough time regulating their own body temp. Do what you can to help them keep cool using what I've suggested above - before their temps reach dangerous levels (if their core body temp reaches 115 degrees, they will likely die). Mark your calendar! Find me on the radio February 18th, with Farmer Fred! I will be an in-studio guest on the KFBK "Garden Show" and KSTE's "Get Growing" from 9:30am to 11:30am February 18th. I'm super excited to be chatting again with Fred Hoffman, Lifetime Master Gardener, on his two radio programs! The "KFBK Garden Show" on 1530-AM/93.1-FM KFBK in Sacramento, California (each Sunday morning from 8 a.m. to 10 a.m. Pacific Time) is followed by "Get Growing" on Talk 650 KSTE (from 10 a.m. to Noon). At noon, it's the KSTE Farm Hour. You can listen to all the shows, live, via the KFBK.com and KSTE.com websites. If you can't listen while it airs live or via internet streaming, be sure to check back here for the links to the podcasts! You can find links to everything on Fred's web site, http://farmerfred.com/ or on his Face Book page. We'll be talking about everything from the pro's and con's of raising backyard chickens, winter chicken care, chick care, flock maintenance, and bio-security. This will be a great taste of what we will discuss at our chicken classes this spring (go to the Classes tab for more information). "Raising Backyard Chickens - Baby Chicks 101"
How to set-up a brooder and care for your baby chickens in a way that keeps them healthy and safe! How to tell if your chick is sick - learn the signs of illness and what is normal and what isn't. Being able to identify a sick chicken quickly is an important skill of every backyard chicken keeper! For: BACKYARD CHICKENS in Butte, Lake, LA, Mendocino, Napa, Nevada, San Diego, Santa Barbara, Sonoma, Ventura, and Yuba counties. Due to the fires, there is concern about backyard chickens ingesting contaminants from the ground and transmitting these to their eggs. UCD SVM is interested in testing eggs from these backyard flocks for various contaminants such as heavy metals, building materials, chemicals, etc. For: COMMERCIAL or BACKYARD CHICKENS in Alameda, Butte, Contra Costa, El Dorado, Fresno, Imperial, Kern, LA, Napa, Orange, Placer, Sacramento, San Benito, San Diego, San Bernadino, Santa Clara, Shasta, Solano, Sonoma, and Tulare counties. Due to observation of high lead levels in the environment, there is concern that commercial and backyard chickens are being exposed to a level that could pose a public health risk. UCD SVM is interested in testing eggs from these birds for various contaminants such as Pb, PCBs, and PBDEs. If you are interested in submitting eggs, please ship up to 6 eggs from your flock inside a carton and wrap the carton with bubble wrap and/or ship in a box with packing peanuts. For more detailed instructions and examples of how to pack your eggs, please watch this video. Special thanks for this being shared on California Chickens!